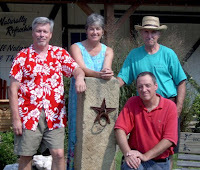 On Saturday evening, August 13th toes will be tapping to the Loosely Strung Bluegrass Band. If you like easy going Americana music, bluegrass style.. this is the place to be! The show starts at 7:30pm. Loosely Strung, a Columbus based band, features crisp, close vocals and harmonies with a 5-string banjo, rhythm guitar, lap steel, manodlin, harmonica, steel-top resonator guitar and an upright bass. Lots of familiar traditional country and bluegrass tunes will be played. You're encouraged to sing along! The box office opens at 6:30pm. Suggested door donation $7.00. The Clifton Opera House is located at 5 So Clay Street, Clifton 45316. Call 937.342.2175 for more information. The opera house is air conditioned.